SEC Commissioner Hester Peirce has a penchant for saying, “No,” when it comes to her agency’s enforcement work. The Securities and Exchange Commission’s newest Republican has emerged as the right-leaning body’s biggest contrarian since she arrived in January and started voting on cases the agency’s Division of Enforcement recommended the SEC bring or settle in-house, according to a Bloomberg Law analysis of SEC records. Peirce opposed more of these enforcement actions in part or in full than her four fellow commissioners did during her first four months in office. She often has stood alone on those votes and against Chairman Jay Clayton, an independent appointed by President Donald Trump, and Republican Commissioner Michael Piwowar. Peirce could become a significant obstacle to Clayton on enforcement. Clayton, who sets the agency’s agenda, has approved every in-house action he has voted on since Peirce and Democratic SEC Commissioner Robert Jackson were sworn in together this year. The SEC in the coming months will lose Piwowar, who is stepping down this summer, and Democratic Commissioner Kara Stein, whose term expired last summer, unless she is reappointed. Clayton would need the support of Peirce or Jackson to take action if the commission drops to three members. Take the SEC’s $14 million penalty in March for the New York Stock Exchange and two affiliated exchanges for alleged failures related to multiple disruptive market events. Peirce voted no on the settlements with the exchanges. Or, for example, an almost $1 million settlement in March to resolve anti-corruption compliance allegations against Canada’s Kinross Gold Corp.? No. Or the $4.45 million deal in February to settle claims that Deutsche Bank misled customers? Yes, except not the corporate undertakings. The matters, which received no opposition from the SEC’s other members, were among 27 that garnered at least some disapproval from Peirce. All of them were related to enforcement. The closest any other commissioner got to Peirce’s voting record was Stein, who dissented in part or in full about half as often as the Republican. Stein registered at least some opposition on 13 matters, including enforcement actions and proposed regulations. It’s “sort of unfair” to call Peirce “doctrinaire,” former Republican SEC Commissioner Paul Atkins told Bloomberg Law. She served as counsel to Atkins at the commission. Peirce doesn’t always disagree in votes. She fully approved more than 85 percent of the matters before her, including all rulemaking. “It is a matter of convincing me,” Peirce told Bloomberg Law. “But I think that’s the role of the commission. 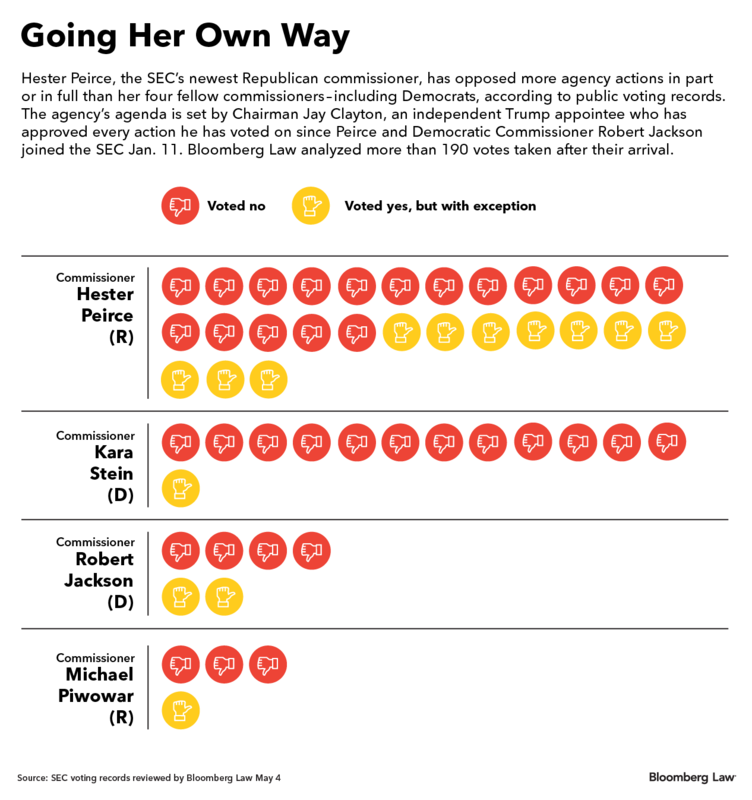 Bloomberg Law reviewed more than 190 SEC votes that drew Peirce’s participation since she and Jackson joined the commission Jan. 11. The data was gathered from the SEC’s “Commission Votes” webpage, which lists final votes on rules, the settlement or institution of administrative enforcement proceedings, and other similar actions. Bloomberg Law last checked the page May 4. The SEC has yet to release votes on cases filed in federal court since the arrival of Peirce and Jackson. Almost all of the voting happened behind closed doors. The SEC on March 6 charged NYSE and two other Intercontinental Exchange Inc.-owned exchanges with the first violation of a November 2014 technology infrastructure and integrity regulation, settling for a collective $14 million fine. The system shutdown caused a trading halt, misrepresented stock prices, and applied price collars without permission. Peirce voted against approving the settlement. Even precedents don’t guarantee Peirce’s approval. Kinross Gold settled SEC allegations March 26 that it didn’t maintain sufficient internal controls to comply with the Foreign Corrupt Practices Act, a law prohibiting foreign bribery. Peirce voted against approving the settlement, which included a $950,000 fine. Peirce, who has written critically about financial regulation such as the Dodd-Frank Act, has “made her antagonism to rules no secret,” Bartlett Naylor, financial policy advocate for consumer watchdog Public Citizen, told Bloomberg Law. “But all commissioners are obliged to uphold existing rules, and should meet infractions with severe penalties,” Naylor said. When voting on enforcement matters, Peirce views “each case on its facts and on the law,” she said. She’s also less inclined to vote in favor of an enforcement action if she feels the enforcement division is “misusing” its limited resources, Peirce said. Peirce doesn’t always approve of the recommended penalty even when she agrees some enforcement action is needed. Deutsche Bank Securities Inc. on Feb. 12 settled SEC allegations it failed to supervise traders and salespeople and failed to detect and prevent anti-fraud violations, allowing employees to mislead customers. Peirce approved the settlement, with an exception as to the corporate undertakings to manage repayment of customer funds. The agency one month later settled with Credit Karma Inc. over allegations the company allowed employees to purchase $13.8 million in unregistered stock. Peirce approved the settlement, with an exception as to the $160,000 corporate penalty. Intercontinental Exchange, Deutsche Bank, and Kinross Gold declined to comment on Peirce’s voting record. Credit Karma didn’t respond to a Bloomberg Law request for comment. Prior to becoming a senior research fellow at Mercatus, Peirce served in various government roles, including the stint working for Atkins. She is “coming in with more experience than any of the other four commissioners,” which “helps inform” her votes, said Atkins, now CEO at consulting firm Patomak Global Partners LLC. Like Peirce, “I’d been a staffer before I became a commissioner,” he said, which might provide “a different perspective” on the agency. Peirce may have more sway over SEC actions if Trump doesn’t ensure all five commission seats are filled in the coming months. Piwowar will leave July 7. Stein’s term ran out last June. Commissioners can keep their jobs for about 18 months after their terms are scheduled to conclude if they aren’t reappointed or don’t have a successor. Their departures could create a three-member commission that could force Clayton to find common ground with Jackson or Peirce if he wants to act. A spokesman for Clayton declined to comment. “She may be paving a new path to the far right if she’s not even in the same lane as Piwowar,” Naylor said.